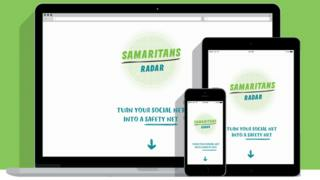 The Samaritans Radar app - created to tell you which of your Twitter followers might be feeling low - has prompted a wave of derision online. Now a petition is calling on Twitter to stop communicating with the service, effectively shutting it down. The idea is certainly a noble one. Once activated, the app tracks tweets from people you follow on Twitter, and emails you if any of them sound distressed. If one of them writes "help me", "hate myself", or any other phrase the organisation deems troublesome, you'll receive an email from the Samaritans nudging you to take a closer look. The tweets are already public, and you might have spotted them anyway, so the service simply highlights things you might've missed. Right? Not so, according to its critics, who have been tweeting and blogging about the service since its launch last week. The app is fraught with problems, they say. It raises major privacy concerns, and is all but tailor made for trolls. Stalkers and online bullies now have a tool that tells them exactly when their targets are at a low ebb, detractors suggest. Users aren't notified when someone begins using the app to monitor their tweets. The hashtag #SamaritansRadar has appeared more than 11,000 times since the app was launched. While some used it to tweet support - "sometimes the only way people reach out is through cryptic statuses" - the overwhelming response has been negative. "How dare you interfere in the complicated emotional lives of others without so much as a by-your-leave? This is appalling," said one. The Samaritans have responded to some of the criticism by allowing anyone on Twitter to opt out of the service by adding their details to a special list. It hasn't been enough to curb the complaints, however, and many are suggesting that the organisation isn't listening. Now an information policy activist, Adrian Short, is asking Twitter to take action itself. On Sunday he created a Change.org petition calling on the firm to block the app from accessing its data. Samaritans Radar can only function with access to Twitter's API, and if the firm denies access to the data, the app would cease to function. "I no longer feel safe talking about my feelings and experiences on Twitter because of this app," wrote one of the signatories - a sentiment expressed by several others. Short says the Samaritans' offer for users to opt out doesn't go far enough. "The vast majority of people who are being monitored by the system are not aware of it," he tells BBC Trending. And as the system has been designed, opting out means passing your details to the Samaritans, something many will not be comfortable with, he says. Salimah Lalji, who works for the Samaritans, says that while the charity is aware of the petition, and is "trying to listen and take on any feedback," there has also been a positive response to the app. More than 3,000 people have activated Samaritans Radar, and it is now tracking over 1.64 million Twitter accounts. We asked Twitter for their reaction to the petition, but have not received a response.